Even though 35mm film dominated the film industry for years and years, the majority of movies released to theaters were much wider than the stock's 4:3 aspect ratio. But instead of sacrificing resolution and simply cropping off the top and bottom of a frame to make it widescreen, filmmakers used special lenses that squeezed a wider vista onto the 35mm film stock, and then unsqueezed the images when they were being projected. They were known as anamorphic lenses, and soon you'll be able to get one for your iPhone. 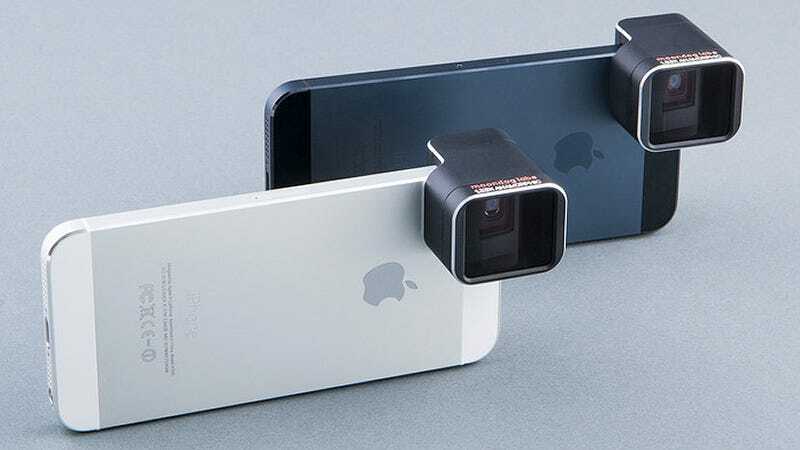 What looks like one of the many external lenses you can get for your smartphone is actually one of the first to do an anamorphic squeeze on your footage, letting you shoot video that's approximately 33 percent wider than the iPhone's standard field of vision. So if you're shooting video in an old-school 4:3 aspect ratio, when the footage was unsqueezed in your video editor it would have a wider 16:9 vista. And if you're shooting in 16:9 to start with, the resulting footage would have an even wider and more majestic 2.4:1 aspect ratio. For still images the iPhone's panoramic mode easily accomplishes this, but this is currently the only way to pull it off for video.